Bar person took several minutes to acknowledge us even though we the only people at the bar. Couldn't have 1st choice of meal because they had run out of ham. When my alternate choice arrived it was lukewarm. My friends meal was incorrect and had to be sent back. We also noticed that several other peoples orders seemed to be incorrect as well. Toilets were a disgrace. The ladies was closed as it was out-of-order and the gents was blocked and about to over-flow. The Abbot was OK but nothing special and the (few) staff seemed friendly enough though rather inefficient. Would not go back again. Lovely little pub in the heart of London, but really need to get rid of the manager, never met anybody so rude in my life!! I hate pubs that craftily try to use beer that has run over for other customers......well the Adam and Eve tried to do it not once but twice. Enter the pub and ask for a pint of London Pride. Within seconds they seem to have pulled a full pint.....well not quite, despite grabbing a fresh glass as if to pour a pint correctly, the bar an had used a pint under the counter and topped it up. The real give away? ...the stale looking froth. When I challenged the barman, he immediately pulled a fresh pint ....presumably the stale pint went back under for another punter. Well twenty minutes later when I ordered my next pint, I saw them do exactly the same. I had complained to Westminster weights and measures about another west end pub doing the same a year or so ago, clearly the practice is wide spread. 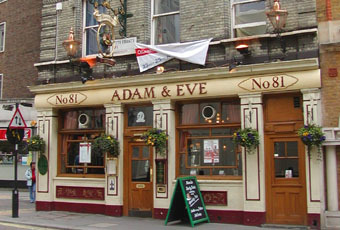 All I can say is if you want a fresh pint ....avoid the Adam and Eve. Needs a good manager to this pub back to how it was a few years back. Spirit Group need to invest heavily in training to bring their pubs up to acceptable standards. Most of their pubs exist because of location not service or quality.